Bill Meehan, managing partner at Rutan & Tucker, LLP a long-time supporter of Komen OC mission programs. Bill and his company have supported many of our fundraisers, including our Reds, Whites and Greens golf tournament, Pink Tie Ball and Race for the Cure. Allyson Brooks, Ginny Ueberroth executive medical director endowed chair of Hoag’s Women’s Health Institute. Hoag has been a great supporter of our mobile mammography and Latina outreach. Recently, we also partnered to host the first Spanish language cancer survivor conference in Orange County. Devon Lawson, metastatic breast cancer researcher and professor at the University of California, Irvine. She is co-leader of the UCI Breast Disease Oriented Team, which she helped establish to facilitate collaboration between UCI physicians, scientists, and local breast cancer advocates to promote an integrated environment for breast cancer research and clinical care at UCI. She also has been a speaker at the Komen OC Education Series for several years. Marica Pendjer, principal of Creative Collaborations, a boutique Orange County-based marketing and public relations firm. She served as Komen OC Board President from 2005 to 2007, was chair of the Race for the Cure and 2012 Pink Tie Ball Chair. Her work with Komen has earned her a Cameo Award, BMW Ultimate Drive Local Hero Award, Kellogg’s Rise and Shine Award for outstanding volunteerism, and recognition as Volunteer of the Year. Pete Tzavalas, senior vice president at Challenger, Gray & Christmas, Inc. He is actively working to bring Komen OC to the attention of businesses and encourage their financial support. His company has sponsored a table at the Pink Tie Ball for several years and brought a new mix of guests to support the cause. 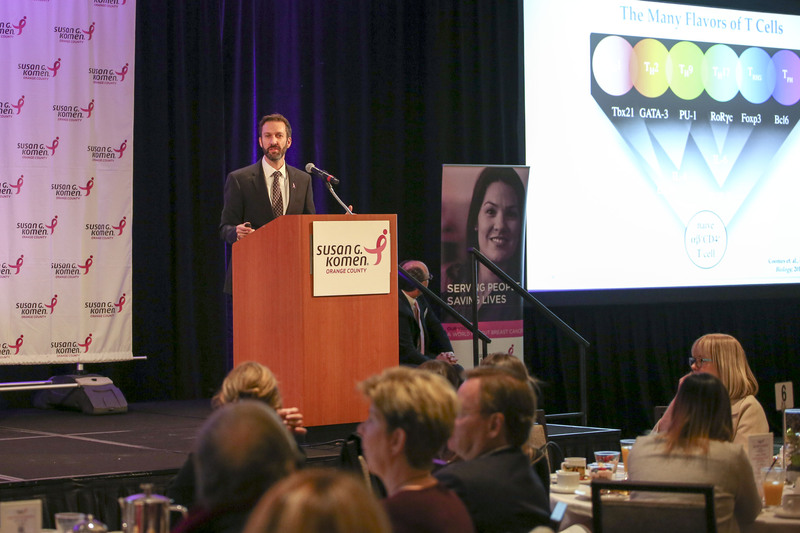 Thanks to the efforts of our Pink Tie Partners and the 450+ guests in attendance, this year’s gala raised $617,000 to help fund our bold goal to reduce the current number of breast cancer deaths by 50 percent in the U.S. by 2026. Since its inception in 2007, the Komen Orange County Pink Tie Ball has raised nearly $6 million and recognized a total of 84 Orange County businessmen and community leaders as Pink Tie Partners. The Pink Tie Ball is one of several fundraisers we organize each year to help fund breast cancer education and services such as free mammography screenings benefitting women in our community. Join us at our next big event, Race for the Cure, on Sunday, Sept. 23, at Fashion Island in Newport Beach. To take advantage of early-bird registration fee, sign up at www.komenoc.org/race. With our beautiful Southern California weather, why not enjoy a day in the water while raising money to support local breast health education, services and research? This Cinco de Mayo, come join us for the 7th Annual Standup for the Cure fundraiser at Newport Dunes. All proceeds from this family-friendly event will benefit Komen OC. Beginner and experienced paddlers, as well as “dry-foot” participants, are all welcomed. In addition to paddling clinics and races, there will be yoga classes, free breast cancer and skin cancer screenings provided by Kaiser Permanente, live music and a delicious lunch. There is also an opportunity to win great prizes through the raffle and silent auction. We also look forward to the Sea of Pink, a ceremonial parade uniting the hundreds of paddlers in attendance, where we pay tribute to our bold and inspiring survivors. In 2017, StandUp for the Cure raised more than $70,000 for Komen OC. Komen Orange County, along with other Komen affiliates in California, advocate for non-partisan issues on key breast health and breast cancer-related bills at the local, state and national level. The Susan G. Komen for the Cure® Advocacy Alliance is the non-partisan voice for over 3.1 million breast cancers survivors and the people who love them. 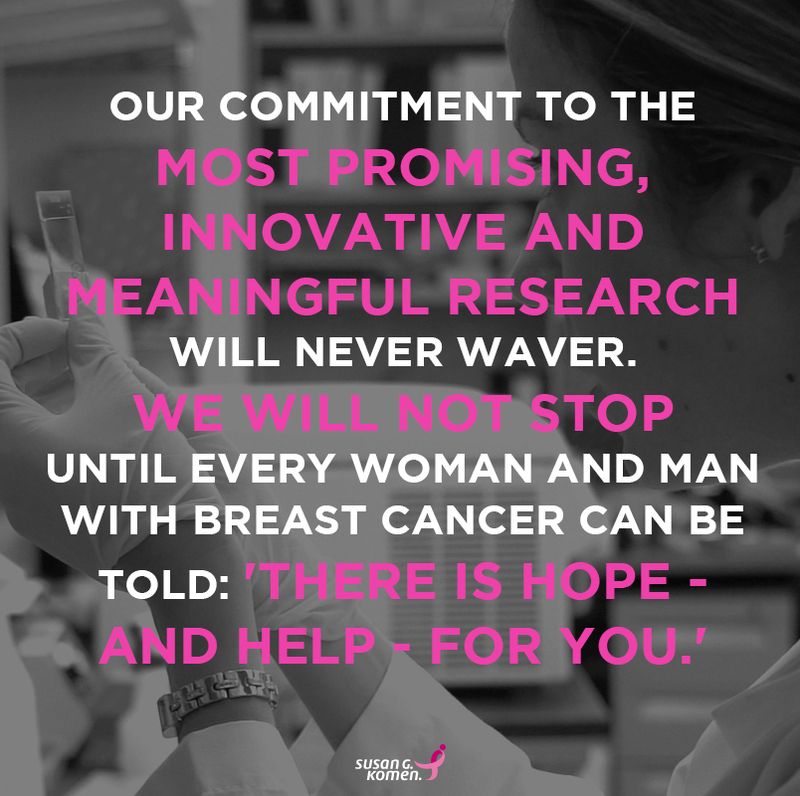 Our mission is to translate the Komen promise to end breast cancer forever into action at all levels of government to discover and deliver the cures. 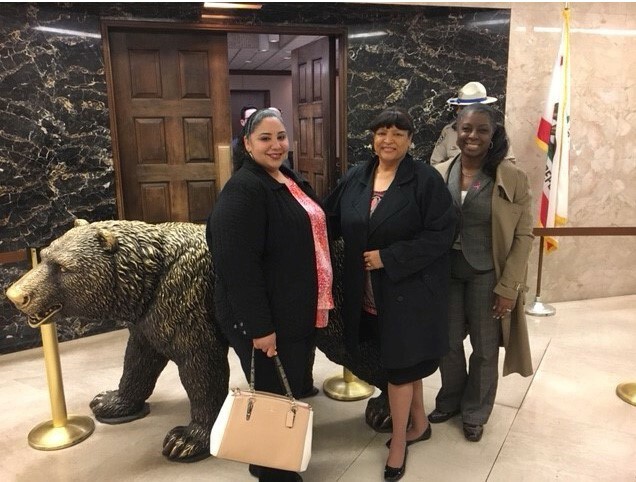 AB 1860, proposed by Assemblywoman Monique Limón (D-Santa Barbara), will ensure that oral anticancer medication – which is preferred by most patients or in many cases, the only form of treatment available – are affordable and covered by health plans or insurance. Specifically, this bill would permanently require health care service plans and health insurer to limit patient out-of-pocket costs to $200 per filled prescription. The development of oral chemotherapy has allowed cancer patients to live a more normal and regular life while undergoing treatment, but currently, the high cost of this type of medication deters many patients from receiving the treatment they need in order to fight their disease. Senator Toni Atkins (D-San Diego) will introduce SB 945, a legislation that seeks to remove arbitrary caps in the Breast and Cervical Cancer Treatment Program for low-income, underinsured, or uninsured women in California. Currently, the program caps treatment for breast cancer at 18 months, regardless of medical need. We believe that arbitrarily stopping cancer treatment for our most vulnerable women is risky and potentially life-threatening. SB 945 would remove those caps and allow the program to continue to provide treatment for cancer patients as long as necessary. Advocates from Komen Orange County lobbying for breast health care for all. L to R: Director of Mission Programs Ambrocia Lopez, Board Member Dr. Devera Heard, and Community Resource Advocate LarLeslie McDaniel. Komen is proud to support these two bills that are critical to ensure breast cancer patients, especially in Orange County, are getting the treatment they need. To learn more about our Advocacy Alliance, click here. February is Black History Month. Did you know that African American women have a survival rate that’s 41 percent lower than their counterparts? The same research indicates that African American women are often diagnosed at later stages, sometimes with more aggressive forms of cancer and at younger ages. Susan G. Komen has pledged to ensure that this group of women are empowered with the information and tools they need to take charge of their own health and serve as ambassadors in their local communities. We sat down with Komen OC’s LarLeslie S. McDaniel, Circle of Promise Community Resource Advocate, to discuss this alarming trend and Komen’s initiative to change this reality. 1) Can you explain why there is an immense disparity between African American women and their counterparts in diagnosis/survival of breast cancer? Uninsured or underinsured without access to high quality medical treatment and/or screening services. 2) What are some general tips to reduce the risk? “Know your risk.” Learn about your family health history and talk to your health care provider about your own personal risk. “Get Screened.” Ask your doctor which screening tests are right for you if you are at a higher risk. Have a mammogram every year starting at age 40, if you are at average risk. Have a clinical breast exam at least every 3 years starting at age 20, and every year starting at age 40. “Know what is Normal for You.” Know how your breasts look and feel and report any changes to your health care provider right away. “Make Healthy Lifestyle Choices.” Maintain a healthy weight. Exercise regularly. Limit alcohol intake and menopausal hormone use and breastfeed, if you can. 3) What is the Circle of Promise? 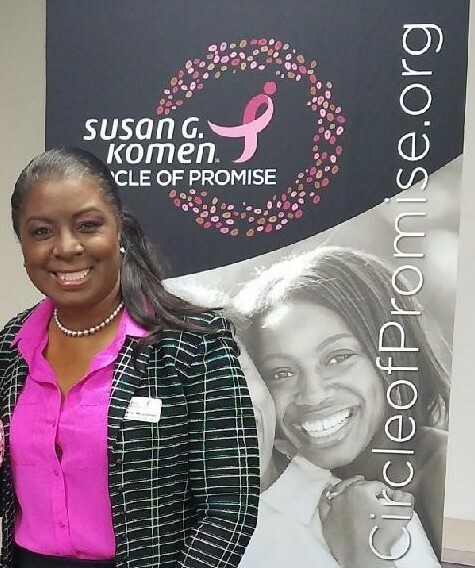 The Circle of Promise is a California Initiative created by all Susan G. Komen affiliates in the state of California, including Orange County, to address breast cancer disparities at all levels, specifically targeting African American women age 40 and older. The goal of the initiative is to empower women with the knowledge and resources to enter and seamlessly move through a quality, culturally competent system of health care; to get information, get support and gain access to services that could save their lives. 4) What local resources are available for African-Americans in Orange County if they are uninsured or underinsured, and in need of mammography screening and other resources? Komen OC can help. Our network partners with health care agencies, hospitals, various community partners and companies to provide all the possible resources to support women, and their families, through their breast cancer experience. You can find resources for mammography, support groups, financial assistance, and local events among others. We encourage you to help us rewrite the story. The COP Partnership meets bi-monthly for members to learn more about community partnerships and increase breast cancer awareness in the African American community. 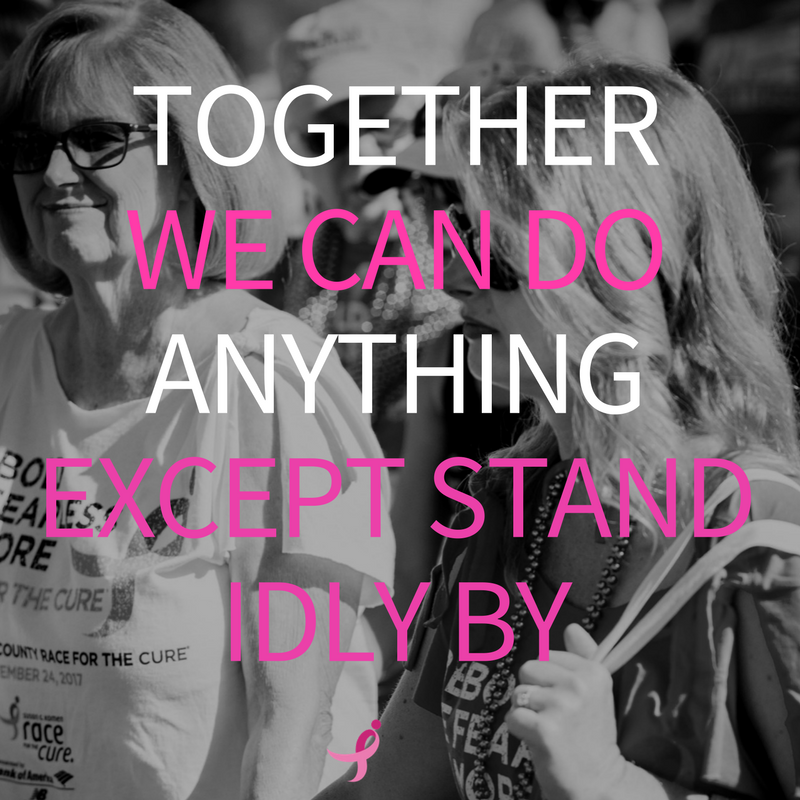 The next meeting is on Tuesday, March 27, at 7 p.m. at the Komen OC Affiliate office on 2817 McGaw Ave. Irvine, CA 92614. 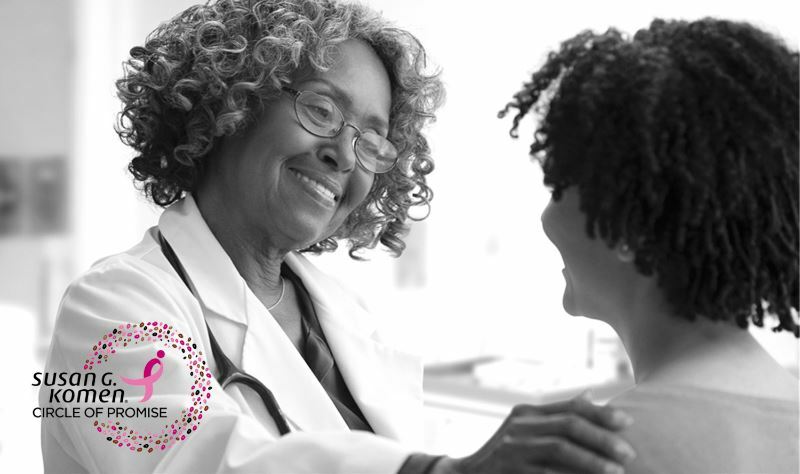 Help us rewrite the story of African Americans and breast cancer by joining the Circle of Promise. You can reach LarLeslie McDaniel at 714-957-9157 Ext. 29 or lmcdaniel@komenoc.org. Thanks to our supporters and generous donors, we wrapped up 2017 with a bang. Through our signature events like the Race for the Cure and Pink Tie Ball, and through individual contributions, we raise funds throughout the year that enable women, right here in Orange County, to detect and survive breast cancer. To date, we are proud to say that we have invested more than $40 million in education, diagnosis, treatment and support programs that serve uninsured or underinsured residents in our local community. provided 8,307 free clinical breast exams to those who otherwise would not have received them. provided 7,007 free mammograms to uninsured and underserved women. detected breast cancer in 64 women, who would otherwise not have known about their cancer. supported 86 women with financial assistance so they can finish their treatment. reached 67,617 people through the year-long breast health education series. Nationally, research on metastatic breast cancer (MBC) remains a priority for the Komen organization. Every 13 minutes, one woman or man dies from MBC, which causes nearly all of the 40,000-plus breast cancer deaths each year in the United States. To date, Komen has spent more than $166 million in over 400 research grants and more than 40 clinical trials focused on metastatic breast cancer. 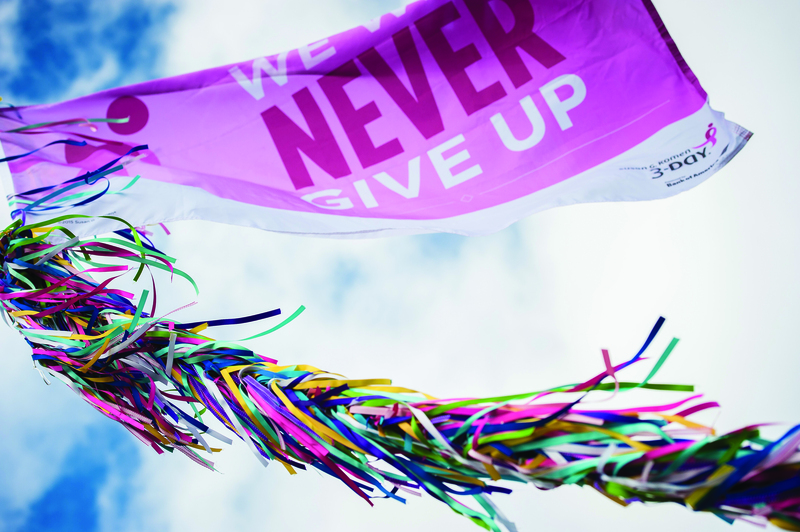 We won’t stop until we find a cure! Locally, we’re excited for our partnership with Cal State Fullerton, working together to identify ways to enhance patient navigation services in Orange County. The goal is to ensure that breast cancer patients receive support all the way through treatment. More info to come in the upcoming months. Individually, we invite you to Be More Than Pink and make a difference by being part of upcoming Komen events by attending, supporting, fundraising and/or volunteering! Visit the Komen’s events page regularly to get the latest updates on where we are in the community. 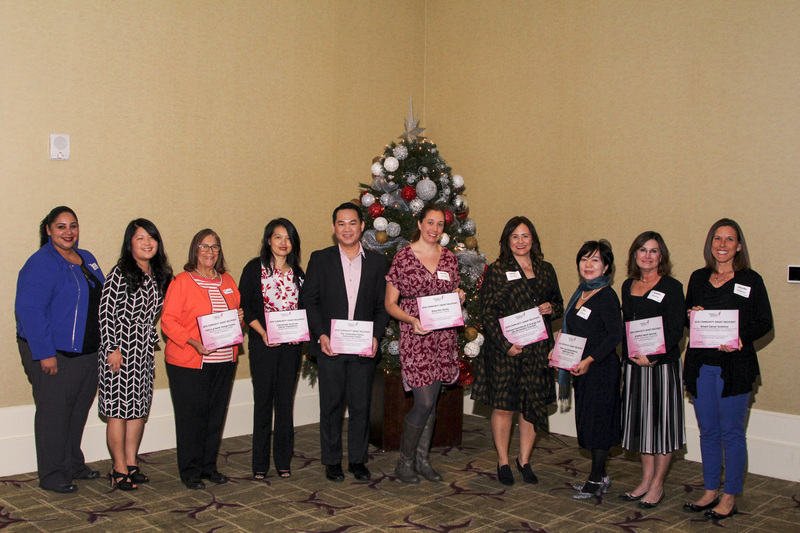 Earlier this month, more than 250 supporters gathered at The Westin South Coast for Komen OC’s annual Grants Award Breakfast, where $649,966 was awarded to eight Orange County organizations that provide breast health care services to men and women in the community. 2018 Komen OC grant recipients. From L to R: Komen’s Director of Mission Services Ambrocia Lopez; Komen Board member Dr. January Lopez; YMCA of North Orange County Past President Rosamaria Gomez-Amaro; Vietnamese American Cancer Foundation Executive Director Becky Nguyen; The Cambodian Family Community Center Executive Director Vattana Peong; Share Ourselves Nurse Clinic Manager Kristin Almieri; Planned Parenthood of Orange and San Bernardino Counties Vice President of Development Laurie Rayner; Nhan Hoa Comprehensive Health Care Clinic Boardmember Duc Vuong; AltaMed Health Services Nurse Practitioner Deborah Binning; and at Breast Cancer Solutions Executive Director Jennifer Anderson. The event highlights include a keynote by Komen Young Investigator Dr. Adam Soloff, a research health scientist at the Ralph H. Johnson VA Medical Center in Charleston, S.C. Dr. Soloff shared about his compelling research on the development of a novel breast cancer vaccine and new drug to block cancer cells from hiding in the body’s immune system. If successful, this treatment strategy could not only kill existing breast cancer cells, but also produce long-term immune memory that may prevent breast cancer recurrence. Dr. Adam Soloff presents his research about the development of a novel breast cancer vaccine at the Komen OC Grants Award Breakfast. Additionally, attendees heard from a very special Komen-funded patient navigator, Cindy Phou, from the Cambodian Family Community Center. At the young age of 23, Cindy shared her story about how she is making a difference in the life of Angkearoth, a 44-year-old breast cancer patient, wife, mother and immigrant from Cambodia, who spoke very little English. The inspirational event concluded with the presentation of the “More Than Pink Award” to two of Komen OC’s partners, Kaiser Permanente and Knott’s Berry Farm, for their loyal contributions to Komen OC throughout the years. Find out more about Komen OC’s 2018 grant recipients here. Please note that grant recipients do not provide any grant funds directly to individuals. For information on how to navigate an individual for diagnostic breast health services through this program, click here or call (714) 957-9157. As this year is coming to an end, we reflect back on our gratitude for the millions of dollars that you, Komen OC supporters, have helped raised in 2017; the thousands of volunteers that give their time and talent help fight against breast cancer; the hundreds of sponsors that have stepped in to make events like the Pink Tie Ball and Race for the Cure possible; and the dedicated board of directors and staff that lead this organization every day. Our biggest fundraiser of the year, Race for the Cure, raised more than $1.2 million this year! Since its inception in 1991, the Orange County Race for the Cure has raised nearly $40 million toward cancer research and awareness. This year’s “On the Edge” Pink Tie Ball event raised more than $635,000 to fund the next generation of research and local initiatives to achieve the organization’s Bold Goal, to reduce the current number of breast cancer deaths by 50 percent in the U.S. by 2026. 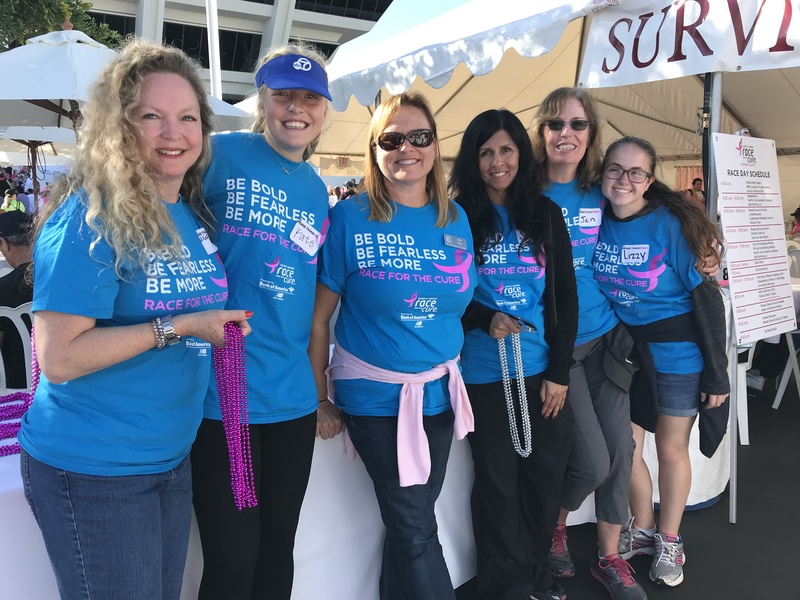 Did you know that 75 percent of the funds raised through Komen Orange County events like the Pink Tie Ball and Race for the Cure support local breast cancer awareness and education programs right here in Orange County? The other 25 percent is allocated to the Komen Award and Research Grant Program to fund groundbreaking breast cancer research, and to support Komen researchers in their quest for a breast cancer cure. More than 1,600 volunteers assisted in preparation for this year’s Race for the Cure, at booths, water stations, on the course and clean-up. An exclusive group of 7 Orange County male advocates committed to the local fight against breast cancer were named Pink Tie Guys, joining 77 other Orange County businessmen and community leaders selected over the past decade. Three members joined Komen Orange County’s board of directors for 2017-2018. Elizabeth Chao, MD, University of California, Irvine, and Lisa Sparks, Ph.D., Chapman University, are new to the board, while Lisa E. Guerra, MD, Breastlink, is a returning member. This addition brings a wealth of knowledge and leadership to the organization, furthering its fundraising efforts and community awareness throughout the year. New board of directors for 2017-2018. And last, but not the least, we are grateful for our sponsors, including our third party supporters. We have developed wonderful relationships with our sponsors and supporters, and without them, we would not be able to do half of what we do. ABC7; The Allergan Foundation; BNP Paribas; Carol & Becky Burch; Chevron; Cox Communications; Experian; Fashion Island; First American Title Insurance Company; Greenberg Traurig, LLP; Harald Herrmann; Tari & Alain Hirsch; Holland & Knight; Hot Ticket Racing; Ingram Micro; Kaiser Permanente; Knott’s Berry Farm; Lee Ann Canaday of The Canaday Group; Macy’s; Modern Luxury Orange County; Myriad Genetics; The Orange County Register; Orora Packaging Solutions; Pacific Life Insurance Company; Park Newport Apartment Communities; Plaza Bank; Ralphs and Food4Less; Saks Fifth Avenue; Karen & Scott Sherman; Smart Levels; 100.3 The Sound; Spa Gregories; Sparkling Ice; Tom & Marilyn Sutton; Karin & Scott Wheeler; Winston’s Crown Jewelers.